This was Alan White's 97th show with Yes! I was there. I was 16. Wakeman's cape had mirrors that reflected off the spotlight. I had never heard of a Mellotron and was wondering where the choir was during the Hallelujiah Chorus solo section. Squire looked like a dancing stork with a cape of his own. Anderson danced around as if he was a puppet with strings attached to his arms. I think this was Alan White's first show with them - Bruford was not there. And the Stravinsky opening was like nothing I'd ever seen before. . . an incredible, historic show. I saw them many times after that, but it was never like that again. Ferocious. 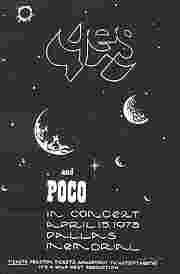 I went to the show initially to see the opening act, Poco. I enjoyed the Poco set very much. I was not prepared for the life changing event that would follow. 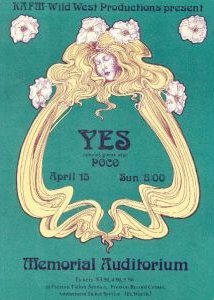 I was in awe of Yes. The Yessongs album set followed this tour if memory serves me correctly. I went on to see Yes atleast five more times. Yeah I was there too, eighteen at the time. I seem to remember that Rick Wakeman stole the show. He was phenomenal in every sense of the word. Back then I was more into Alice Cooper and Black Oak Arkansas so seeing YES for the first time was a real culture shock. The other thing I recall is the numerous guitars Howe had on stage, why that stuck in my mind I don't know. 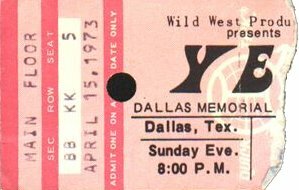 I have the ticket stubb for the Memorial Auditorium show. Poco was the opening act. It was one of my first concerts so needless to say I was blown away... from the opening of Stravinski's "Firebird Suite" and "Siberian Khatru" to the oncore of "Roundabout." Having 4th row seats gave me a great perspective of the show. I saw Yes five more times thereafter.